This is my last C2C day, another 19 mile day. Breakfast at 7:30, cereal, yoghurt, 2 poached eggs and very good sausage. Yorkshire honey (on toast) was excellent. I took an apple and a mandarin orange for lunch and started out at 8:30. 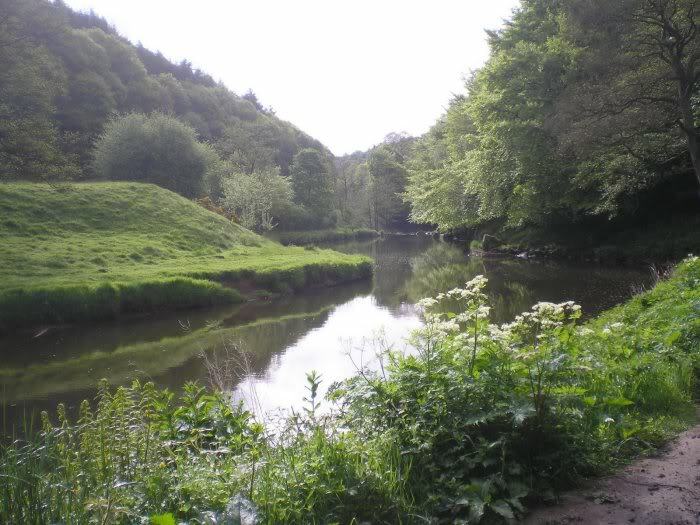 A step across the road and I’m on the path to Robin Hoods Bay and the North Sea, up through the woods along the River Esk. 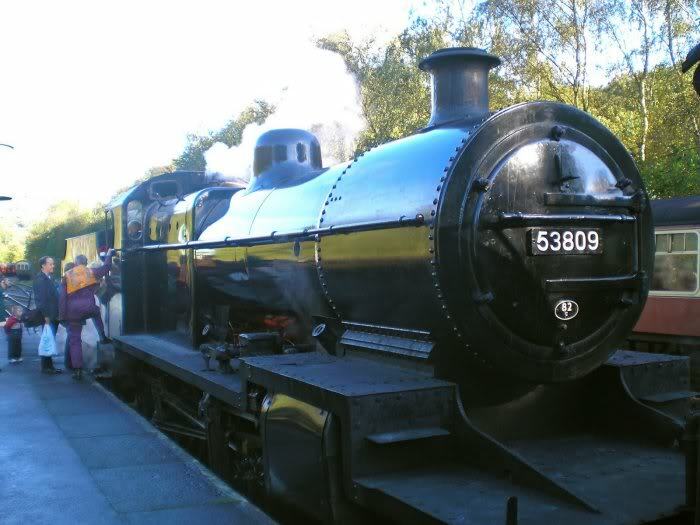 In Grosmont, I take a photo of the steam trains and buy a Cadbury's to supplement lunch. 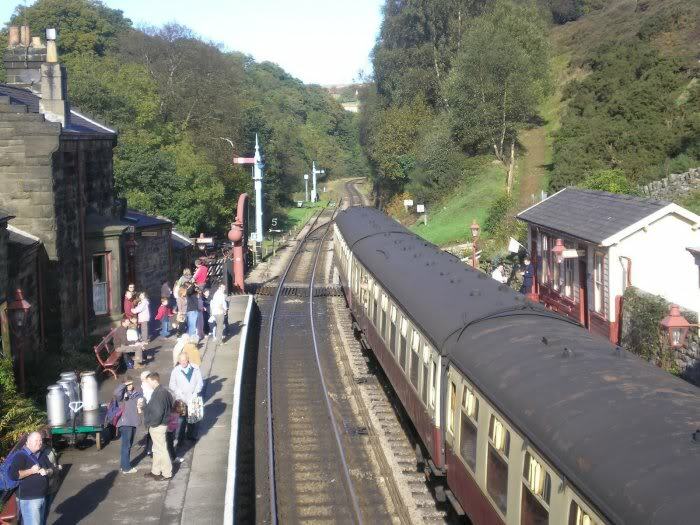 In 2006, I scheduled a short walk from Glaisdale to Littlebeck so I could take the steam train from Grosmont to Goathland, only about a 20 minute ride through the Esk valley. 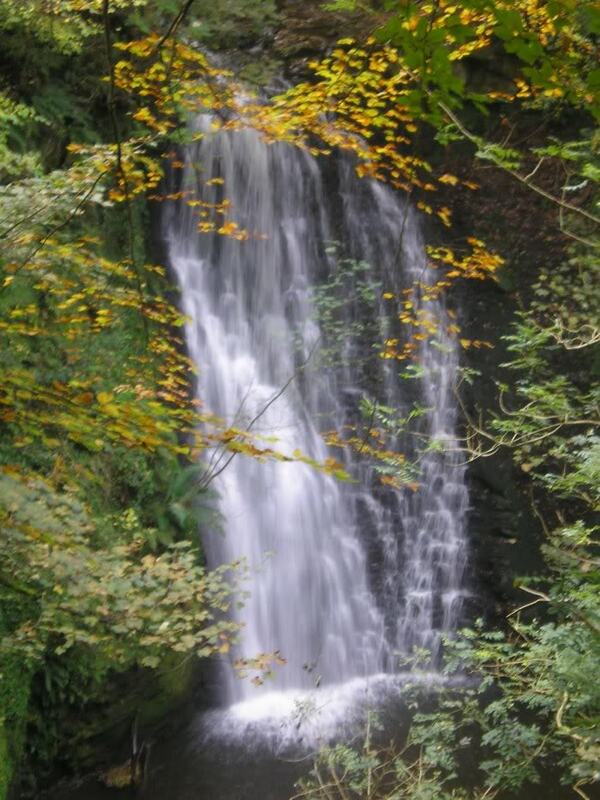 I decided to walk out from the village to Mallyam Spout waterfall, but ran into a TV crew filming Heartbeat (a popular TV series), the heir to Herriot's All Creatures Great and Small. What a crush of cars and spectators, never did get to the waterfall. Back to the village, had an ice cream (this is a tourist spot, you know), then a train ride back to Grosmont. At the Station Pub, I had a cuppachino and talked with a French tourist wearing a beret and scarf who looked and dressed amazingly like Francis Ford Coppola (I attended his 67th birthday party at his winery two years ago). I like that look, maybe I'll try it! 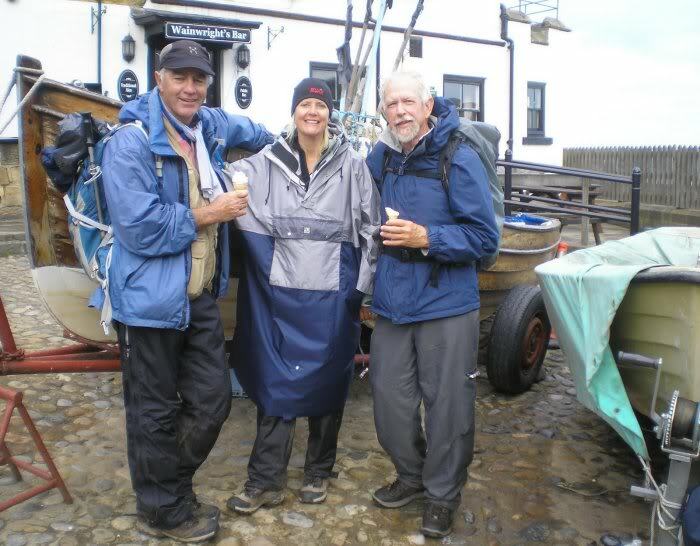 Back to 2009..... as I leave Grosmont, the rain starts and I put on my Ducks Back. It was off and on rain the rest of the day. 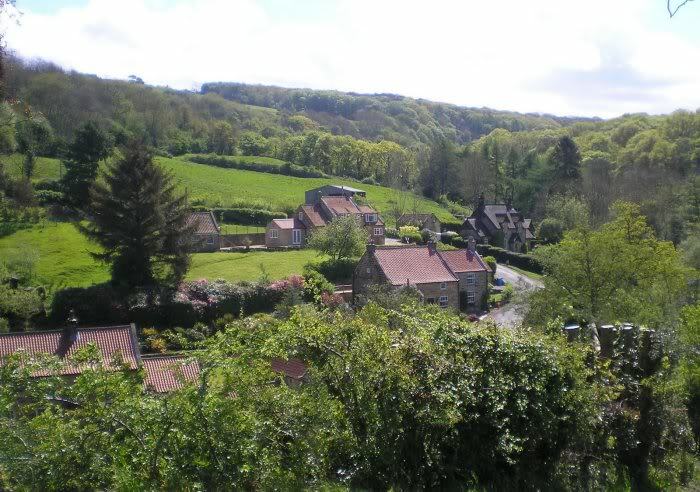 Out of Grosmont is the incredibly steep road famous for taxing the most hardy C2Cers. One mile of it, a catch-your-breath section, then another mile not so steep. 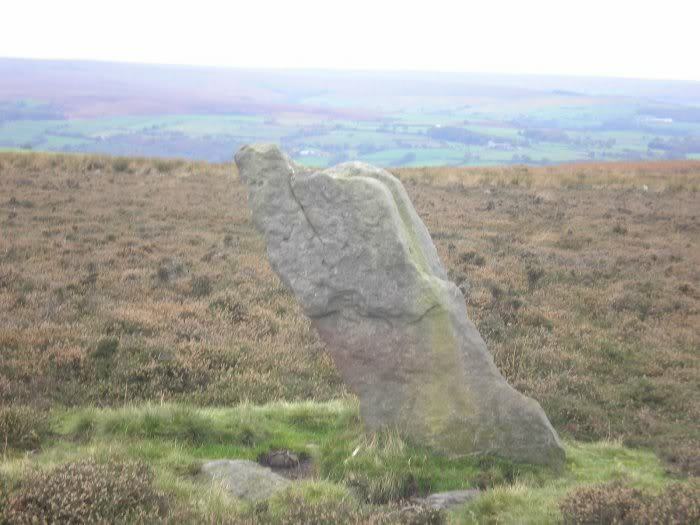 I am now at the top of Sleights Moor and pass by groups of ancient standing stones. 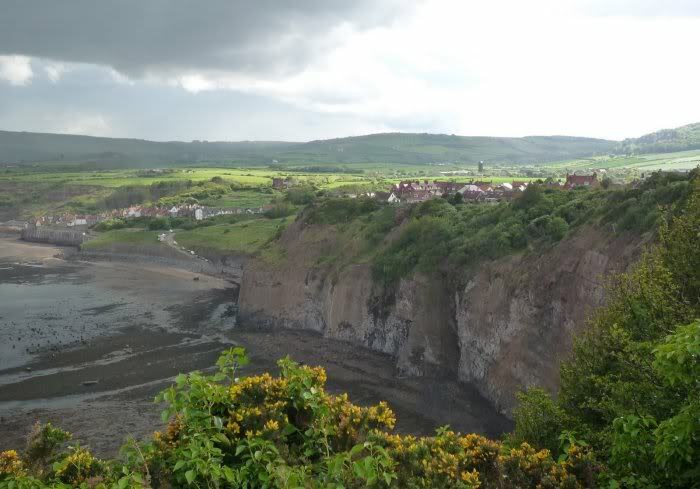 A first view of Whitby and the coast opened up at the one mile point. A large car park is full of buses and trailers for the Heartbeat film crew (again), but I cut across the boggy heather to catch a track and lane leading steeply down into Littlebeck. 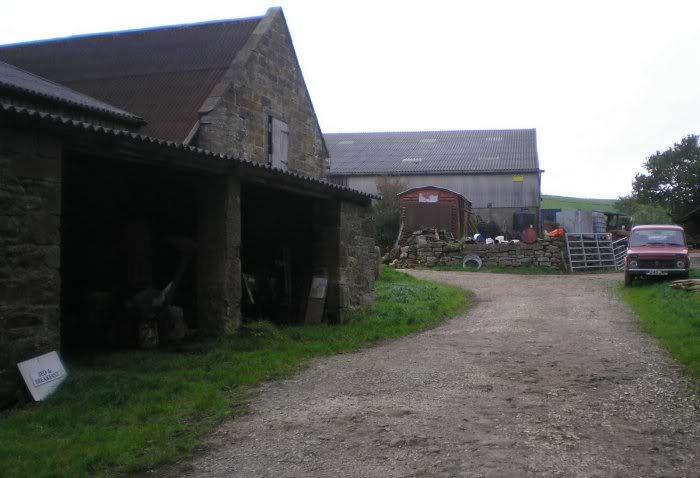 In 2006, I took the side road up to Intake Farm B&B less than a mile south of Littlebeck. The entrance is totally unpretentious, definitely a working farm. Judith greeted me with tea and coffee cake in a kitchen as cluttered as the farmyard, but it works. I have a large comfortable bedroom full of books and magazines, her college daughter's room. Downstairs is a wonderful sitting room with a roaring fireplace. There are five others staying here tonight, walkers but not on the C2C. Dinner was family style, chicken, sausage, ham, leeks, carrots, potatoes, cabbage and stuffing. Quite a meal! The five other guests had three bottles of wine which they shared with me. Then dessert, plum and apple crumbles with decaf coffee. Enough already! For such a small village, Littlebeck is full of interesting historic buildings. 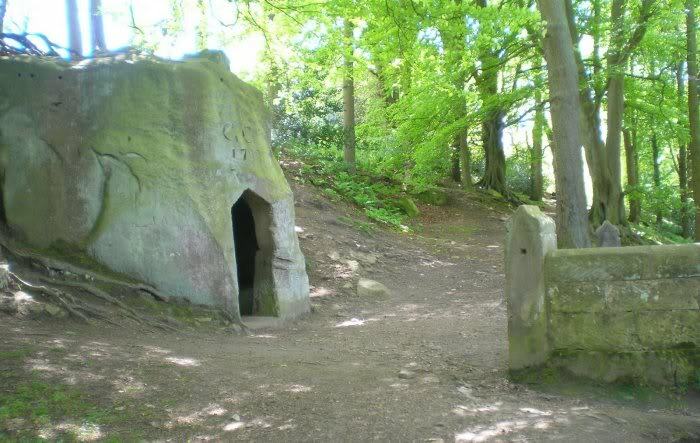 Here, the C2C enters the forest on a trail following Little Beck to the Hermitage, a 1790 stone shelter, then to Falling Foss, an absolutely beautiful waterfall perhaps 200 feet high. This was a good place to eat my modest lunch. In Oct 2006, a red fox appeared in the path, surprised to see me, and scampered back up the hill. In a few minutes, three hunting dogs were furiously sniffing down the path and to both sides. 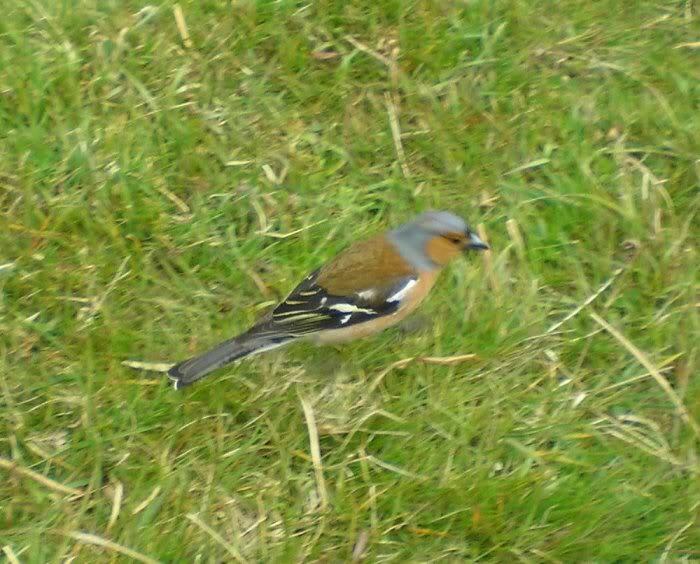 After lunch, I said goodby to a beggar bird and carried on past May Beck Farm, on lanes and across moorland until I reached the dreaded muddy, boggy moorland of Graystone Hills. These bogs are as much fun as the bogs of Nine Standards fame. 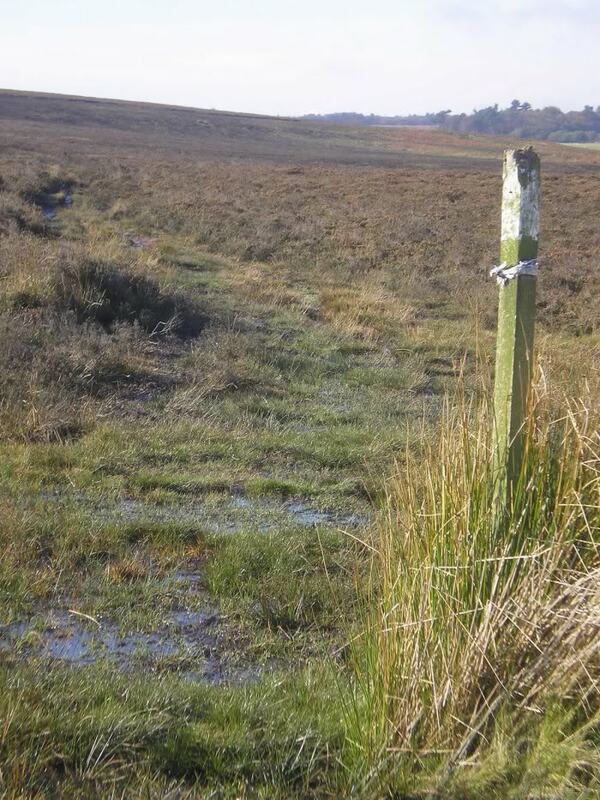 As Wainwright might say, "a delight for bog lovers". After this, its not far to the coast. I had previously taken the coastal path to RHB in 2006, so this time I took the faster cycle path on the old RR bed which runs just above the coast path. 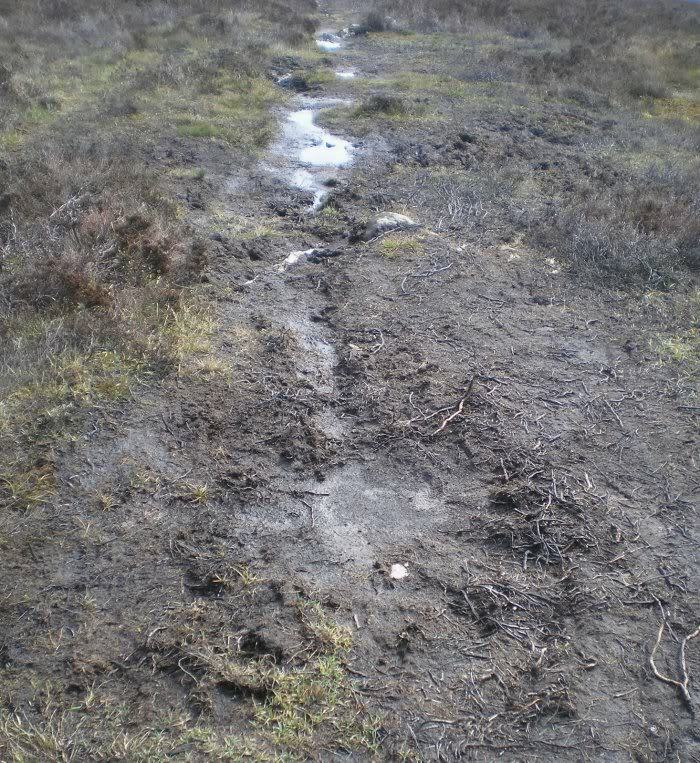 The walk today has surprisingly been has been long and difficult, much bog trotting and many steep inclines. I was rainy wet and tired and ready to dip my boot. The tradition is to carry a pebble from the Irish Sea to the North Sea, and also to dip your boots in the sea water on each coast. As I merge with the coast path at RHB, I see Bill and Katie coming up the coastal path, an amazing coincidence. It was 5 pm and I hadn’t seen them all day. We took photos, threw pebbles, dipped boots and agreed to have dinner together at the Bay Hotel where they are staying. I check in at Upside Down Cottage, a quirky kind of place as the name indicates, but comfortable and near the bottom of the village. I relax with a hot chocolate, then go out to phone Cathryn with my PO phone card. We have a nice long talk, then I shower and go to meet B & K for dinner. Its 7 pm and the van group of walkers are just arriving at the Bay Hotel and look totally knackered. 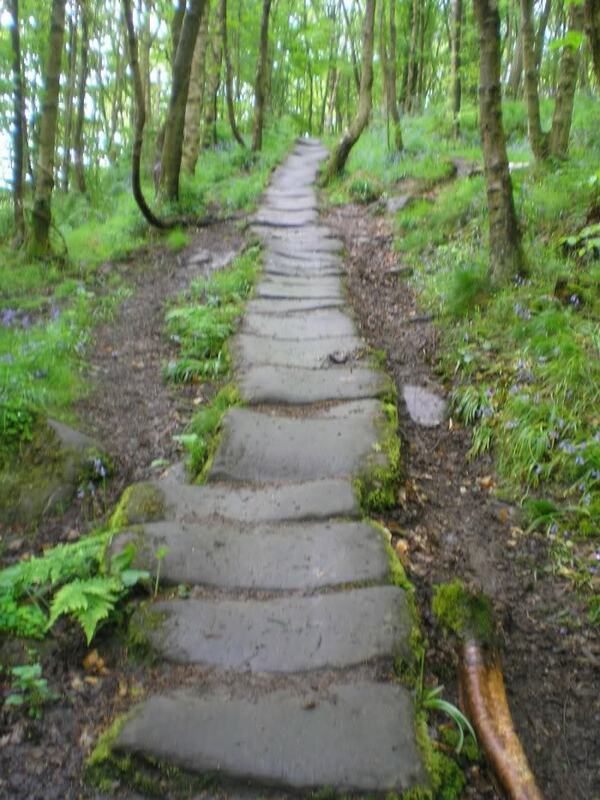 The lady that fell and hurt her ankle at Gunnerside Gill has made it the whole way. She says she is in great pain and her ankle is swollen black and blue. I don't know how she did it. Actually, I do know. But more on that in the next section where I tell about my accident in 2006 on the coast trail. 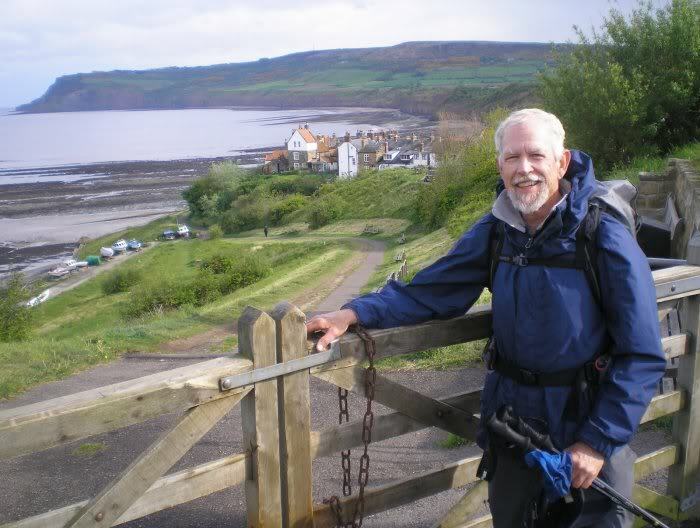 That account will pick up the 2006 story as I arrive at the coast from Littlebeck and take a diversion north for two days instead of immediately walking south to RHB. Bill and Katie and I have some pints and dinner together and reminisce about the walk. Tomorrow, they will catch an early bus to Whitby, then the train all the way to Devon. 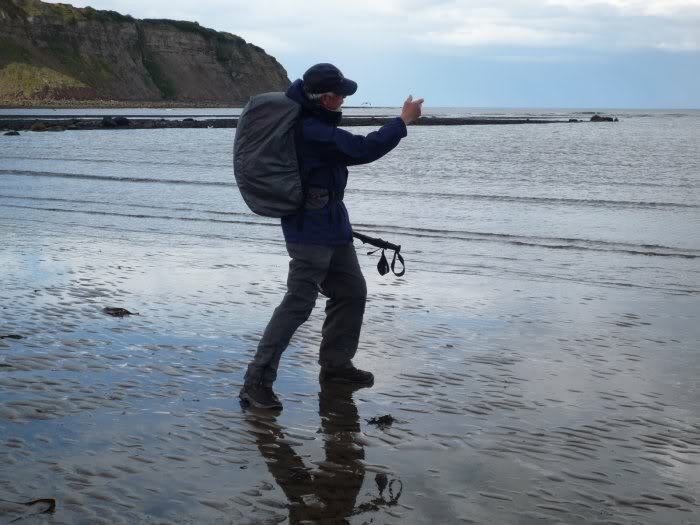 I will continue walking to Scarborough to take the train to York, then on to Heathrow the next day. Even though its Monday night, the restaurant/bar is full and loud and we all are having a good time. Finally, its time to call it a night, we exchange emails and hug our goodbyes. Nice people. I hope to see them again someday.